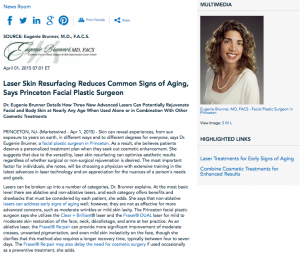 Dr. Eugenie Brunner details how three new advanced lasers can potentially rejuvenate facial and body skin at nearly any age when used alone or in combination with other cosmetic treatments. Princeton, NJ—Skin can reveal experiences, from sun exposure to years on earth, in different ways and to different degrees for everyone, says Dr. Eugenie Brunner, a facial plastic surgeon in Princeton. As a result, she believes patients deserve a personalized treatment plan when they seek out cosmetic enhancement. She suggests that due to the versatility, laser skin resurfacing can optimize aesthetic results regardless of whether surgical or non-surgical rejuvenation is desired. The most important factor for individuals, she notes, will be choosing a physician with extensive training in the latest advances in laser technology and an appreciation for the nuances of a person’s needs and goals. Lasers can be broken up into a number of categories, Dr. Brunner explains. At the most basic level there are ablative and non-ablative lasers, and each category offers benefits and drawbacks that must be considered by each patient, she adds. She says that non-ablative lasers can address early signs of aging well; however, they are not as effective for more advanced concerns, such as moderate wrinkles or mild skin laxity. The Princeton facial plastic surgeon says she utilizes the Clear + Brilliant® laser and the Fraxel® DUAL laser for mild to moderate skin restoration of the face, neck, décolletage, and arms at her practice. As an ablative laser, the Fraxel® Re:pair can provide more significant improvement of moderate creases, unwanted pigmentation, and even mild skin inelasticity on the face, though she clarifies that this method also requires a longer recovery time, typically between four to seven days. The Fraxel® Re:pair may also delay the need for cosmetic surgery if used occasionally as a preventive treatment, she adds. In addition to enhancing skin tone and texture as an independent procedure, Dr. Brunner indicates that laser skin resurfacing can be added to other treatments to maximize an aesthetic outcome. She says that facelift, brow lift, and neck lift operations are designed to address excess skin and moderate to severe creases; however, these methods cannot reduce fine lines, skin discoloration, or uneven texture as laser rejuvenation can. Furthermore, she states that cosmetic injectables—another popular non-surgical enhancement option—address separate issues as well, including volume loss and wrinkle development. By combining techniques to suit the anatomic indicators and cosmetic goals of the patient, she believes that individuals can achieve more comprehensive benefits while minimizing downtime. Ultimately, Dr. Brunner says she strives to educate patients about the multitude of aesthetic enhancement options available, including both surgical and non-surgical procedures. She indicates that laser skin resurfacing offers a minimally invasive way to achieve more youthful-looking skin with little to no downtime. She also notes that this approach can be used alone or as a complementary treatment alongside other rejuvenation techniques, and individuals considering cosmetic treatment should speak with a board-certified facial plastic surgeon to determine if they make a good candidate. Dr. Brunner is a double board-certified facial plastic surgeon practicing in Princeton, New Jersey. She received her undergraduate degree from Rutgers College before continuing her education at Robert Wood Johnson Medical School, where she earned her medical degree with honors. She then completed additional training at New York University Medical Center in head and neck surgery (otolaryngology), and she completed a fellowship at the University of Toronto in Advanced Cosmetic Facial Plastic Surgery. The recipient of numerous accolades, she is also an active member of several esteemed medical organizations, including the American Society for Laser Medicine & Surgery. She is available for interview upon request. For more information about Dr. Brunner and her practice, please visit brunnermd.com and facebook.com/BrunnerMD.